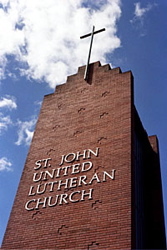 On Friday, February 15th, 2008, Inlaws & Outlaws will screen at the St. John's United Lutheran Church in Seattle WA. The screening will begin at 7:00pm, and will take place at the church. All are welcome to attend! "If you are looking for a faith community that is inclusive, open-minded, and committed to service, St. John United may be a place for you. We welcome all people seeking to discover (or rediscover) the power of God's love in their life and the life of the world."